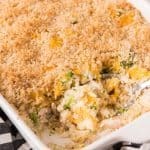 There's something so nostalgic and comforting about a good casserole for a weeknight dinner and this Chicken Broccoli and Rice Casserole hits all the comfort food buttons. It's cheesy and savory with tender bites of chicken and broccoli in every bite. Preheat oven to 400 degrees. Lightly spray a 9x13" baking dish with non-stick cooking spray. In a large skillet or pot, melt the butter over medium heat. Add the onion and garlic to the melted butter and saute until fragrant and the onions are translucent. Whisk in the flour. Slowly whisk in the chicken broth, a little at a time, until there are no lumps of flour remaining. Continue to cook over medium heat, stirring frequently, until the sauce coats the back of a spoon. Stir in the salt, pepper, and poultry seasoning, and remove from heat. Stir in the sour cream and milk. While the sauce cooks, microwave the broccoli florets in a large bowl covered with plastic wrap, until bright green and tender, about 2 to 3 minutes (no need to add water). Be careful not to overcook or they will become soggy and discolored. This step is optional, but it helps the broccoli be more tender with less overall cooking time for the entire casserole. If you prefer your broccoli to be less soft, just skip this step. In a large bowl, combine the rice, chicken, broccoli, and sauce, folding everything together until evenly coated and ingredients are mixed. Pour into prepared pan. Sprinkle the top of the casserole evenly with the grated cheddar cheese. In a small bowl, mix together the panko, Parmesan cheese, and melted butter. Sprinkle evenly over cheese layer. Cover with aluminum foil and bake for 25-35 minutes or until heated through. Remove the foil and bake another 10 minutes until the panko crumbs are golden brown. If you don't have poultry seasoning on hand, just use 1/4 teaspoon sage, with 1/8 teaspoon each of thyme, marjoram, and rosemary, along with a pinch each of nutmeg, black pepper, and cayenne pepper for a quick DIY homemade poultry seasoning blend that makes just enough for this recipe.